The name of this pattern is Bi-Nka-Bi - literally meaning that "no one should bite another" - it is a symbol for peace and fair play (the image is a stylized rendition of two crocodiles biting each other's tail). 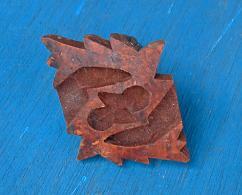 Adinkra stamps are indigenous to Ghana and are carved from calabash. These are actual stamps used in Ghana to make Adinkra cloth patterns. Be creative and stamp them in clay, dough or perhaps just put them on your table as a conversation piece.